Hope in her cap and gown. College graduation is less than two weeks away. What does this mean for my daughter Hope? What does this mean for me as her mom? What is my role to become now? So many questions flood my mind as we anticipate the achievement of another milestone. 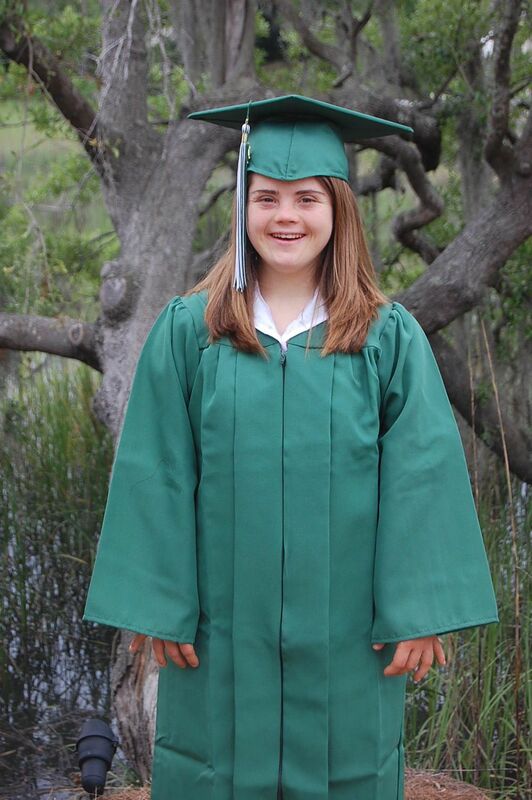 Who would’ve thought, when Hope was born with Down syndrome, that she would have the opportunity to attend college and now graduate? A couple of weeks ago, I learned from friends and family of the birth of three new babies with Down syndrome in the Charleston area. My initial reaction was excitement and an urge to call the parents on the phone and say, “Congratulations! I know that you might be feeling overwhelmed, fearful, and sad right now. I understand! However, you have no idea of the super blessings you will experience by parenting these children.” But, I hold off because I remember… I remember how hard it was in the beginning to create new dreams for my child. The beauty, however, is that we must not stop dreaming about what our children can do. We must have high expectations for them. They can achieve! I want to tell these moms that they will become a fierce “Mama Bear” who will be the driving force for their child’s future. So what will Hope’s future look like? We are still trying to figure that out. She plans to return to Clemson in the fall, live with a friend and work at Mr. Knickerbockers. So what will my role be? To become more of an advisor to Hope, instead of trying to control so much of her life and prevent her from failing. There is so much freedom in letting go. I remember that transition with my boys when they went off to college. What happened as a result? We developed an even closer relationship as I listened more. I advised, but then let go. Distance made it easier — the “out of sight, out of mind” mentality kicked in. And the same happened with Hope…well, sort of. The fact that she called me five times a day kept me more involved than I wanted to be, but the distance helped. Being four hours away from her has helped both of us grow in so many ways. 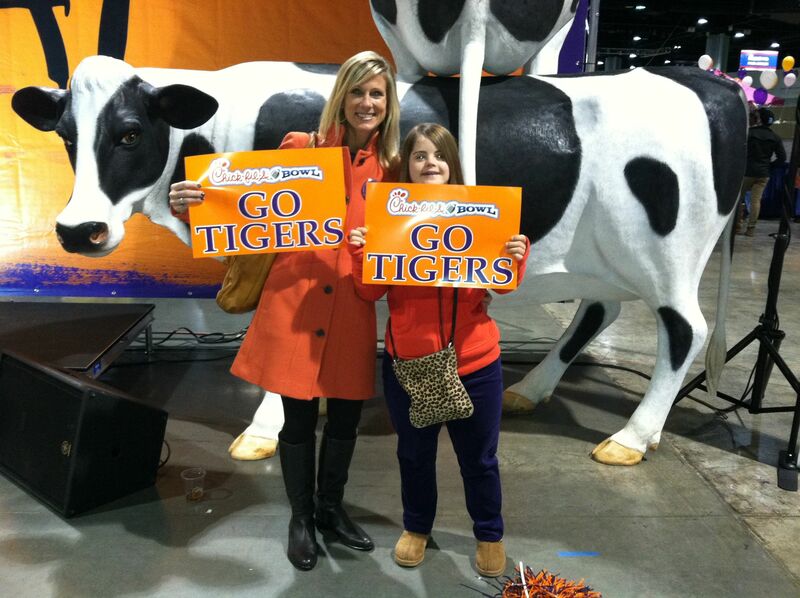 Hope and her mom at a Clemson football Bowl game. You can try to control from any distance, but there’s no freedom in that. I must say that while Hope’s been in college, I have been made aware of circumstances where I did need to step in and become involved. 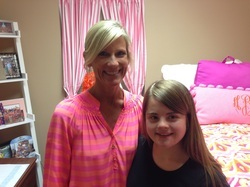 That transition to college looks different when you are parenting a child with an intellectual disability. In my experience, you still need to be somewhat of an active parent, but the shift to advisor does come — just more slowly. And I must say, that it has taken me four years to transition into that role. I was speaking with a sweet friend a couple of weeks ago who asked me if I treated Hope as my little girl or as the adult daughter that she is. I was so convicted by that question, because I am guilty of still treating her as my little child. I really have failed to acknowledge in my mind that Hope is an adult, living independently and making her own decisions. If I acknowledge that, then I am acknowledging that my role is changing from an active “Mama Bear” to a more sedentary role. That mindset shift is difficult. That would be acknowledging that Hope is an adult who is capable of living her own life without me. But what a blessing! Isn’t that what we want for all of our children? I’m so thankful for friends that help me see clearly the blessings in transition, and when I need a new perspective. Your heart and mind will always be with your children for the rest of your life. You never stop caring about your child, no matter how old either one of you are. But our job descriptions are different. Not only do we become advisors, I believe that we also have the responsibility and privilege to pray for them. I ask God to spiritually duct tape my mouth shut when I need to be silent and nudge me when I need to speak. I’m also asking that my words be uplifting and encouraging, not critical as they tend to be. I have so much to tell these new parents of the babies with Down syndrome. It is a different journey, one that you didn’t plan, but you will have the privilege of watching your child have an impact on others in ways that you and I could never do. You will love like you’ve never loved, you will weep like you’ve never wept, you will find joy in simple things — all because of the gift of parenting your children. I believe God can give you a new perspective on life and keep you humbled and grounded. We graduate from one role to the next throughout all of our kids’ lives, but our influence remains. When you feel like you are losing your kids or being fired from your job as moms, I believe that there is no greater active role than a praying mom on bended knee. Follow this journey on Spreading a Little Hope. The Mighty is asking the following: What’s one thing you thought on the day of your or a loved one’s diagnosis that you later completely changed your mind about? If you’d like to participate, please send a blog post to [email protected] Please include a photo for the piece, a photo of yourself and 1-2 sentence bio. Check out our Submit a Story page for more about our submission guidelines. Jennie is Reid’s wife and the mother of 3 children, Blake (24), Hope (23), and Davis (20). Hope has Down syndrome.